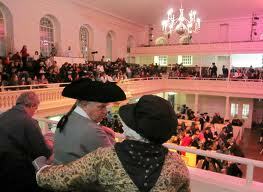 Boston 1775: The 2012 Tea Party Reenactment, 16 Dec.
Old South Meeting House and the Boston Tea Party Ships are hosting their annual reenactment of the Boston Tea Party on Sunday, 16 December—the exact anniversary of that event in 1773. 1. General admission seating at Old South Meeting House, the actual 18th century landmark where the colonists gathered in 1773, for a recreated town meeting. Ticket holders are seated for this portion of the program which lasts about an hour. 2. Special, escorted access along the procession route to the harbor. Ticket holders will walk for up to 30 minutes from Old South Meeting House to the Harborwalk behind the InterContinental Boston hotel. The audience will meet additional colonial characters on route. 3. Special reserved viewing area on the Harborwalk behind the InterContinental Boston hotel with best sight lines to the action aboard the Brig Beaver at the Boston Tea Party Ships & Museum. This fully-narrated program lasts about 1 hour. Ticket holders will remain standing in the reserved viewing area. The reenactment starts at 4:00 P.M. on Sunday afternoon, and it looks like it will last past 6:00.